"Thank you for a fantastic Australian wine experience - great tastings, great company"
Our 14 day Australian tour took in top wineries across Victoria, South Australia and Western Australia. Starting in Melbourne, we explored Pinot Noir in Mornington Peninsula and Yarra Valley, headed north to Heathcote, Nagambie Lakes & Beechworth and sampled rare Liqueur Muscats in Rutherglen. We flew to Adelaide to taste Cabernet Sauvignons and Shiraz in McLaren Vale, Eden & Barossa and Australia's best Rieslings in Clare Valley. Our tour ended in Western Australia in Swan Valley & Margaret River. Winery visits included: Grosset, Cullens, Yarra Yering, d'Arenberg, Jim Barry, Leeuwin, Vasse Felix, Bindi, Chateau Tahbilk (pictured right), Campbells and memorable tastings with winemakers Stephen Henschke, David Hohnen, Louisa Rose and Jeffrey Grosset. Our fun relaxed 10 day tour included visits to coastal San Antonio and Casablanca, northern Aconcagua region down to southerly Maipo, Rapel and Colchagua in Chile. We flew over the majestic Andes to visit Argentina's great wine region, Mendoza. Our trip ended in Buenos Aires for a fun night out with a tango show. 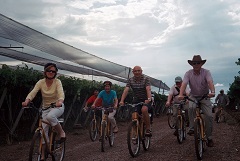 Winery visits included: Errazuriz, Montes, Casa Lapostelle, Santa Rita and Anakena in Chile - Catena, Terrazas de los Andes, San Salentein and Zuccardi (we cycled around the vineyards stopping off for tastings enroute) in Argentina. We will be returning to South America in 2016 : see our upcoming tours. "A great way to see this beautiful country"
We flew over to New Zealand for a memorable 13 day wine tour of North and South Island wineries which included wonderful visits to Stoneyridge on Waiheke Island, Craggy Range (Steve Smith MW gave us a tasting at Craggy Range pictured right), Esk Valley and Te Mata in Hawkes Bay, Dry River and Escarpment in Martinborough, Cloudy Bay, Seresin and Allan Scott in Marlborough and Rippon Vineyards and Felton Road in Central Otago – as well as enjoying a stormy wine tasting cruise across the Marlborough Sounds! We will be returning to New Zealand in 2015: see our upcoming tours. 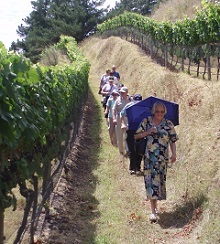 "An all round superb experience"
We have hosted two popular wine tours to South Africa. Our recent tour in 2014 began with an excursion to Cape Point and lunch at Cape Point Vineyards - followed by tasting at Klein Constantia, marathon lunch at Buitenverwachting in Constantia, sampling Cabernets at Rustenberg, enjoying a traditional brai with Pinotage at Kanonkop in Stellenbosch and tasting with winemaking wizard Miles Mossop (pictured) at stunning Tokara. Heading west, we lunched with the Hamilton Russell family near Hermanus in Walker Bay, sampled at Cape Chamonix and dined at La Motte in Franschhoek with an alfresco tasting lunch at Lammershoek in Swartland - finishing up at one of our favourite estates, Springfield in Robertson. Read Rose's Travel Blog on this popular Cape wine tour. 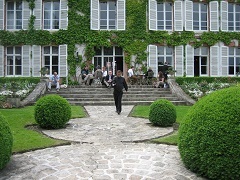 "Brilliant, brilliant, brilliant fun - I will be back"
We have hosted numerous wine tours to Champagne. Our regular Champagne tour includes a week's indulgent stay, based in the beautiful city of Reims, with visits to leading houses and small growers. We have enjoyed lavish lunches at Bollinger, Pol Roger, Joseph Perrier, Drappier, Perrier Jouet (pictured), Moet & Chandon's Chateau Saran and Taittinger's Chateau La Marquetterie, evening candlelit dinners at Charles Heidsieck, Ruinart and Comte de Dampierre's chateau in Chenay. Our trips have included memorable tastings at Krug, Henri Giraud, Philipponnat, JL Vergnon, Vilmart and Gosset. "An unique chance to visit cellars you cannot normally get access to"
We have escorted two very popular pre-harvest tours to Bordeaux. Staying in splendour in historic chateaux in the Medoc. Lunching at Chateau Palmer in Margaux, Chateau Pichon Longueville Baron in Pauillac and Chateau Suduiraut in Sauternes - and dining at Chateau Beychevelle in St Julien. Our trips have included memorable tastings at Chateau Latour in Pauillac (pictured), Chateau Margaux, Vieux Chateau Certan in Pomerol, Chateau Leoville Barton in St Julien and Chateau d'Yquem in Sauternes. "Great tastings, great company - great fun too"
Based in the beautiful old town of Beaune (pictured), we explored top domaines, negociants and growers in Cote de Beaune and Cote de Nuits. We headed south to the pretty villages of Rully and Mercurey in Chalonnaise and sampled at Vire Clesse and Pouilly Fuisse's leading estates. Wineries visits included: Joseph Drouhin, Domaine Arlaud, Christophe Cordier, Olivier Leflaive, Louis Jadot, Faiveley and Vincent Dureuil-Janthiel. We hosted a second tour to Burgundy this June 2015 visiting some these producers again - and others including Chateau de Beauregard in Pouilly Fuisse, Michel Lafarge in Volnay, Bouchard Pere & Fils in Beaune, Domaine Michel Briday in Rully and Clos du Moulin aux Moines in Auxey Duresses. "Loved meeting all the small producers"
Our visit to one of France's most beautiful river valleys began sampling Sauvignon Blancs in the hilltop cobbled town of Sancerre and across the Loire in Pouilly Fume. Heading west, we sampled delicious Cabernet Francs in Chinon and Bourgueil - and sparking, dry and sweet Chenin Blancs in Anjou and Vouvray stopping in at beautiful chateaux along the River Loire enroute. Visits included lunch with Domaine Huet in Vouvray, Domaine Baumard in Savennieres, Charles Joguet in Chinon and Chateau de Tracy in Pouilly Fume - and we also tasted at Vacheron in Sancerre and Langlois-Chateau in Saumur. "Well done - we visited all my favourite Alsace growers and the tastings were exceptionally good"
Our pre-harvest tour was based in beautiful Strasbourg and Colmar - and explored the exquisite mediaeval villages of the Vosges. We visited Hugel in Riquewihr, Trimbach in Ribeauville, Zind Humbrecht in Turckheim (pictured right), Marcel Deiss in Bergheim, Domaine Weinbach in Kayserberg, lunched with the family at Domaine Schlumberger in Guebwiller and Josmeyer in Wintzenheim - and enjoyed a marathon speed tasting with the charming Rolly Gassmann family in Rorschwihr. "It was a real treat to visit Sassicaia - but our day at Ornellaia will stay in my memory for ever!" Our six day tour was based in a stunning Chianti countryside castle. We visited top Chianti estates including Frescobaldi and Antinori. We headed south to the fascinating Montalcino region with a wonderful Brunello tasting & lunch at Fattoria dei Barbi (pictured) and rare Brunello tasting at Biondi Santi. Our final day was spent in the famous vineyards of Bolgheri with a memorable lunch at Tenuta dell'Ornellaia - finishing with a tasting at Tenuta San Guido, home of the legendary Sassicaia. "I fell in love with Amarone on this trip - absolutely loved the whole tour"
Our base in Piedmont was in beautiful Barolo visiting top estates including Cascina Fontana, Chiara Boschi, Mascarello Bartolo, Aldo Conterno in Barolo - and Cascina della Rose in Barbaresco. We then headed east to Franciacorta sampling top Italian fizz at Bellavista. Our tour ended in historic city of Verona with visits to top Amarone producers in the Valpolicella hills. We had an extensive tasting at Masi - and even met Mister Amarone himself, Sandro Bosciani - and lunched with Sylvia Allegrini at their beautiful Palazzo della Toro. Our final day was spent sampling top dry and sweet whites with Stefano Inami and Pieropan in the mediaeval town of Soave. 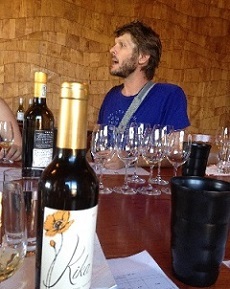 "Great tour, fun company and we visited my favourite Rioja producers!" In 2010 we hosted a very popular trip to Spain. We flew to Bilbao, sampled our way through top wineries in Rioja including historic Lopez de Heredia (pictured right), Muga and La Rioja Alta - lunched in splendour at Remelluri and dined in the famous Marques de Riscal hotel - before heading west to Ribera del Duero region. We visited the famous Vega Sicilia, lunched at Abadia Retuerta and dined with the legendary Alejandro Fernandez at Pesquera – then drove south through Rueda region (sampling enroute) down to historic Segovia, finishing in Madrid. 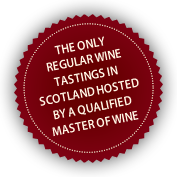 "A great introduction to Austrian wine & its best winemakers - particularly enjoyed the red wines - a great surprise!" This was one of the most popular tours we have run! 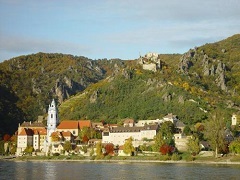 In September 2014, we headed to the Danube valley to taste with top white winemakers Franz Hirtzberger, Emmerich Knoll & Nikolaihof in the Wachau Valley and Willi Brundlmayer in Kamptal - and sampled wines from newcomer Christophe Edelbauer whilst on the Danube itself! We then headed south to visit wineries in Traisental, Burgenland and Neusiedlersee - including Markus Huber, Georg Prieler, Willi Opitz and Kracher. Our top visit of the trip was meeting & tasting with Kurt Feiler-Artinger in the wonderful town of Rust and tasting his superb mature reds at dinner. A detour to pay homage at Haydn's House & Esterhazy Palace in Eisenstadt - and finished with a day off visiting the sites of the beautiful city of Vienna. "I can't tell you how much I enjoyed the trip from all sorts of perspectives, so thank you so much for putting the trip together. 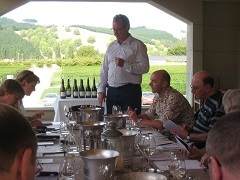 I learnt so much"
A fabulous week of hot weather and wine! 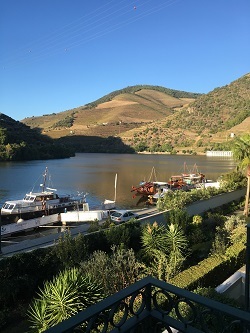 Our tour began in the beautiful Douro valley where we stayed right on the riverside in the splendidly sited Vintage House Hotel (pictured right). We enjoyed sensational lunches at top Port estates Quinta do Noval hosted by Christian Seely and Quinta de Napoles with Dirk Niepoort - and tastings at Quinta de Romaneira and Quinta do Bomfim in the Douro. In Oporto we stayed at The Yeatman, with an evening tasting with Taylor's - and enjoyed day trips to Vinho Verde (visiting Quinta de Soalheiro and Quinta de Ameal), Dao (visiting Quinta dos Roques and Quinta dos Carvalhais) and Bairrada with a fun lunch and tasting with Luis Pato himself aka 'Mr Baga'! Our week's tour ended in Lisbon for sightseeing and a memorable visit to the once legendary and diminishing Colares region - and even discovered their Ramisco vines buried in deep sand on the windy cliff edges by the Atlantic.